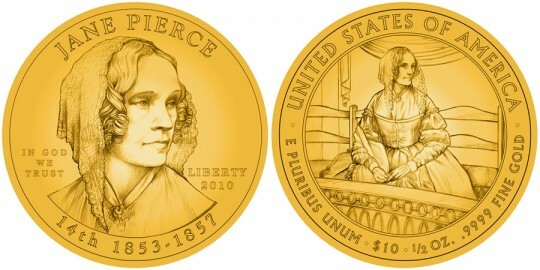 The Jane Pierce First Spouse Gold Proof Coin is the fifteenth in the US Mint series meant to honor the former first ladies of the United States. Each $10 face value coin is struck from 1/2 ounce of 24-karat gold. Jane probably met her future husband Franklin Pierce while he was attending Bowdoin College, where her father was president before his death. The two did not marry for several years, but once they did three children would come to them. The shy and frail Jane always opposed the political advancement of her husband, and that probably led to his retiring from politics while still on the rise as a U.S. Senator. The couple had already lost two children, and she saw his retirement as a chance at happiness. Several years later, however, Franklin was nominated for President of the United States by the Democratic Party in 1852. Upon hearing the news, Jane fainted. Then, two months before Franklin's inauguration, the couple lost their one remaining child in a train accident. Jane blamed the presidency and would spend most of their time at the White House in the residential chambers. The Jane Pierce coin is also available in an uncirculated version. A portrait of Jane Pierce is seen on the obverse of her coin and was designed by Donna Weaver and sculpted by Don Everhart. Also shown are the words "JANE PIERCE ", "IN GOD WE TRUST", "LIBERTY", "2010", "14th 1853-1857", and the mintmark "W". Donna Weaver and Charles Vickers designed the image of Jane Pierce sitting in the visitor’s gallery of the Old Senate Chamber in the U.S. Capitol Building listening to a debate. Also shown are the words "UNITED STATES OF AMERICA", "E PLURIBUS UNUM", "$10", "1/2 OZ. ", and ".9999 PURE GOLD".